Food Corporation of India (FCI), along with state level agencies, has purchased 26.22 million tonne of wheat till date, up 6.75 per cent from last year's corresponding purchase of 24.56 million tonne, data with FCI showed. After a sluggish start, the government's wheat procurement in the ongoing wheat procurement season has gathered pace and surpassed last year's total procurement of 25 million tonnes. 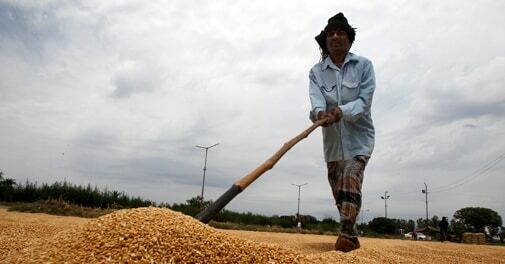 Food Corporation of India (FCI), along with state level agencies, has purchased 26.22 million tonne of wheat till date, up 6.75 per cent from last year's corresponding purchase of 24.56 million tonne, data with FCI showed. FCI has projected a procurement of 31 million tonne in the current season. Procurement is on, though the quantity of arrivals across markets is going down. The government sells wheat to various segments of the population at highly subsidised rates under various welfare schemes. The annual offtake of wheat under various public distribution system schemes is 29 million tonne. A high stock with the government acts as a dampener to prices of the grain in the open market. The government pool had wheat stock of 34.4 million tonne as of early May. Procurement had started on a tepid note and there were apprehensions that purchases this season could slip below last year's 25 million tonne. "Arrivals were low in the initial phase of procurement but picked up gradually," said an FCI official. Arrivals had been impacted due to unexpected rains and strong winds in large parts of Punjab and Haryana in late March and in early April. The maximum wheat has come from Punjab. The state, also known as the granary of India, has contributed 11.33 million tonne of wheat so far, up 4.7 per cent from 10.82 million tonne last year. Madhya Pradesh is the second highest contributor to procurement. Purchases from the state rose 7.67 per cent to 6.59 million tones. Procurement in Haryana was 6.45 million tonne, up 10 per cent.